Why it's great: The dual-action product works both as a heat protectant and medium-hold hairspray, and according to readers, "it is amazing." Users say the product gives hair "lots of volume" and "great hold without feeling heavy or sticky." One reviewer writes, "I would recommend [this to] anyone with dry or processed hair." Agree? Disagree? 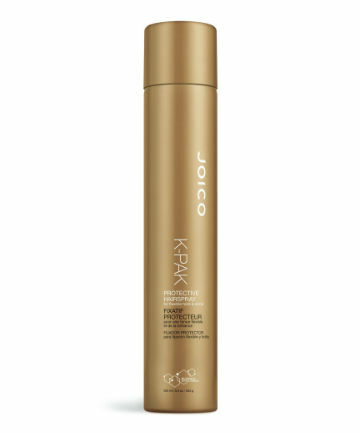 Write your review for Joico K-Pak Protective Hairspray here. I love the Tressemme heat-protection sprays! John Frieda's "Frizz-Ease Thermal Protection Serum" has dramatically changed my hair for the better--no more parched, weed-like ends. My hair is shiny and silky. And all for under $10! The Tresemme Thermal Creations Heat Protectant really caught my eye and I tried it out a week ago and it does its job. I've seen lots of Youtubers use it too.